Don't forget - we will send you a FREE SAMPLE of these mosaics so that you can see them for yourself. Click here to contact us or scroll down to read more and buy now by the box or the sheet. 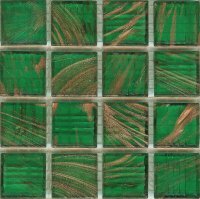 This is a mid green vitreous glass tile with added gold coloured streaks / flecks. The pattern of streaks in each tile is unique so there is always something to catch the eye and to bring the tiles 'to life' when the light catches them! This tile is slightly transparent so the detail of the streaks can be seen inside the tiles themselves. Use a bright white adhesive to show the tiles to their best. Each tile is 2cm x 2cm x 4mm and has a flat face with a slight bevel on each side. The back of every tile is ridged. Available by the box (10 sheets / 2,250 tiles / 1.07 sq m approx) and by the sheet (225 tiles / 0.107 sq m approx). Boxes of this mid green glass mosaic tile with gold coloured streaks / flecks contain 10 sheets of 225 separate tesserae that are held together on a plastic mesh. Each tile is 2cm x 2cm square and 4mm thick. There is a total of 2,250 individual mosaic tesserae per box. Each box covers an area of approximately 1.07 square metres / 11.51 sq ft. Sheets of this mid green glass mosaic tile with gold coloured streaks / flecks contain 225 separate mosaic tiles in a 15 tile by 15 tile grid, with the tiles held together on a plastic mesh. Each tile is 2cm x 2cm square and 4mm thick. Each sheet covers an area of approximately 0.107 square metres / 1.15 sq ft.
Did you know that when mosaic pieces (tesserae) are laid in regular straight lines where none of the pieces line up across two rows - like bricks in a wall - it is described as Opus Tessellatum.